If it feels like we’ve seen it all before, well, we have. The gangsters, the tormented teens, the tough streets of New York’s deeze, dem, dose borough – it’s all the same old stuff in the musical version of A Bronx Tale now at the Golden Gate Theatre as part of the SHN season. And the familiarity isn’t just because this story was previously the basis for Chazz Palminteri’s autobiographical one-man show or the movie version that served as the feature directing debut of Robert De Niro or the upgraded one-man show that Paminteri took to Broadway and then around the country. A Bronx Tale just feels like a cursory retread of a coming-of-age story with the tension coming from a young Italian-American boy’s pull between a mobbed-up good life (choosing to be feared) and the noble life of a working man (choosing to be loved) with a little mixed-race romance thrown in to remind us that the bulk of the show takes place in the late ’60s, even though the musical feels like perpetual 1959. Palminteri adapted his script for the musical, while Alan Menken provides the score, which feels like Hairspray meets Jersey Boys by way of Goodfellas and Glenn Slater provides the pile of clichés that serve as lyrics. If you played a drinking game and took a shot every time someone says or sings the word “heart,” you’d be sozzled by the end of Act 1. For a musical so concerned about heart, it’s interesting that there really isn’t one here – just a lot of slick staging (by co-directors De Niro and Jerry Zaks) and choreography (by Sergio Trujillo) tied together with a by-the-numbers script and a score filled with Frank Sinatra/Bobby Darin/Four Seasons/Motown knockoffs that are pleasant but shallow. The opening number, “Belmont Avenue,” feels like Menken’s opening number from Beauty and the Beast pieced together with leftovers from his Little Shop of Horrors score. The cast delivers exactly what the show asks of them. Joe Barbara makes for an imposing Sonny, the chief goomba. You believe he’s feared in the neighborhood, but even though we see him shoot a guy in cold blood, his toughness tends to evaporate each time he opens his mouth to sing. 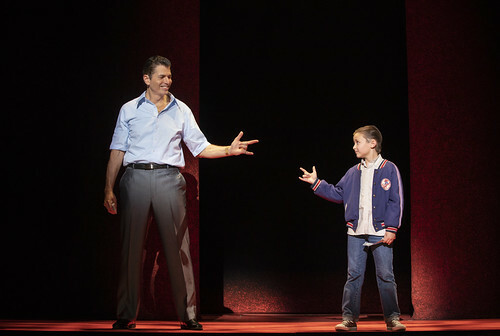 The kid pulled between the forces of good and evil on Belmont Avenue, Calogero or “C” as he’s known by his mob pals, is played as a 9-year-old by Frankie Leonie, who displays some terrific dance moves, and as a 17-year-old by Joey Barreiro, who’s earnest but lacking any complexity. The female characters in the show are, alas, way, way, way in the background. The only one who makes an impression is Brianna-Marie Bell as Jane, the African-American girl from Webster Avenue who catches Calogero’s eye. She doesn’t get a great song or a chance to make Jane anything more than sweet and apparently unbound by societal conventions. Richard H. Blake as Calogero’s noble bus driver dad is a standout here, even though he’s stuck with the sappiest song in the score, “Look to Your Heart.” In a role he originated on Broadway, he’s got a sweet, supple voice that makes his character, Lorenzo, feel like a good guy, even though there aren’t many shades to the man other than he loves his family and is good at a job he does out of duty rather than passion. And that kind of describes this Bronx Tale – competent and fitfully enjoyable but crafted more out of duty than of passion. 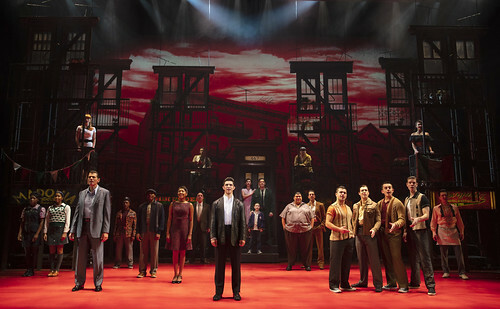 A Bronx Tale continues through Dec. 23 at the SHN Golden Gate Theatre, 1 Taylor St., San Francisco. Tickets are $56-$256 (subject to change). Call 888-746-1799 or visit www.shnsf.com. More great work from Mr. Jones, who ranks high on the list of the best Bay Area theater critics of all time.